Cristin Tierney Gallery is pleased to announce its second annual Black Box exhibition, Janet Biggs: within touching distance. It will feature her new dual-channel work, Written on Wax, and a multi-channel installation of Can’t Find My Way Home, previously exhibited at the Blaffer Museum of Art. Janet Biggs: within touching distance opens on Thursday, January 7th with a reception from 6:00 to 8:00 pm, and the artist will be present. 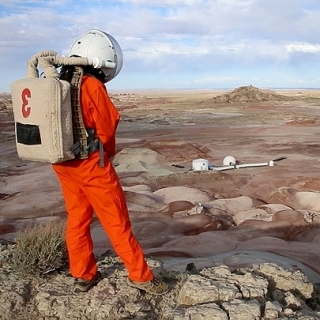 Janet Biggs has traveled the planet to confront the limits of the known world. She seeks out extreme environments that challenge both mind and body, and in the process captures what remains of humanity when everything else is stripped away. Her newest body of work—within touching distance—focuses on the role of memory in the construction of identity. 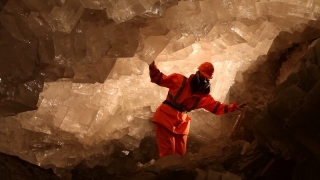 In Can’t Find My Way Home, Biggs combines footage shot in the crystal caves of the German Merkers salt mine with documentation of neurological research conducted in laboratories. 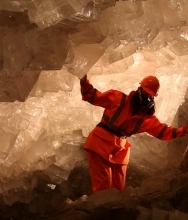 Inspired by her own family’s history with Alzheimer’s, the artist highlights the similarity between the forms of the subterranean crystals and the proteins active in brains with Alzheimer’s disease. As Biggs travels through the mazelike cave and becomes increasingly disoriented, her twisting path echoes that of dementia patients’ journeys through their own fading memories. 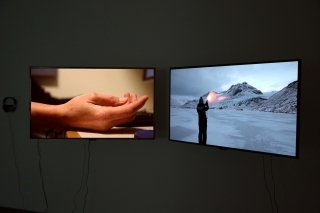 Dual-channel video Written in Wax focuses on how memories are formed. The work documents Biggs' experience with a research study that utilized electric shocks to create new, negative memories that were later altered or erased. 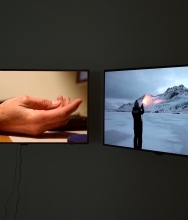 Modifying the process for her video, the artist received a jolt of electricity each time she was shown footage representing one of her earliest recollections of personal autonomy—an image of horse's hooves. The procedure gradually transformed this positive association to a negative one. Her loss of, and subsequent attempt to recover this, presents the viewer with an intimate look at the relationship between memory and identity. For the exhibition, Biggs has created an immersive installation that underscores her interest in the mystery and complexity of the human mind. The multiple channels, precise sequencing, and edits of her videos echo the mechanical aspects of cognitive processes, and create a collage-like aesthetic. 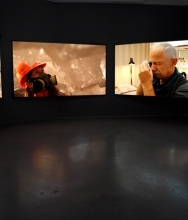 Freed from strict narrative, the scale of Biggs’ projections invite the viewer to evaluate his or her relationship to the larger landscape, reinforcing the videos’ existential content. within touching distance is the gallery's second Black Box exhibition, a model that originated in museums to showcase experimental art forms. Highlighting moving images and new media, Black Box is part of the gallery’s annual programming, and features a diverse array of international artists. 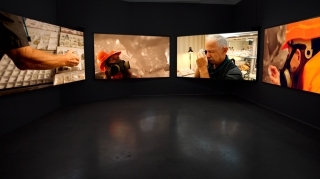 Janet Biggs has had solo exhibitions and film screenings at the Blaffer Museum of Art, Musée d'art contemporain de Montréal, Hirshhorn Museum and Sculpture Garden, Tampa Museum of Art, Skulpturenmuseum Glaskasten Marl, Herbert F. Johnson Museum of Art, Mint Museum of Art, Everson Museum of Art, Gibbes Museum of Art, and the Rhode Island School of Design Museum, among others. Her work was featured in the first International Biennial of Contemporary Art in Cartagena, Colombia, and the first Biennale art nOmad. She is the recipient of numerous grants, including the Electronic Media and Film Program at the New York State Council on the Arts Award, the Arctic Circle Fellowship/Residency, Art Matters, Inc., the Wexner Center Media Arts Program Residency, the Anonymous Was a Woman Award, and the NEA Fellowship Award. Her work appears in the collections of the Fonds Régional d'Art Contemporain (FRAC), Zabludowicz Collection, Skulpturenmuseum Glaskasten Marl (Ruhr Kunst Museen), Tampa Museum of Art, High Museum, Herbert F. Johnson Museum of Art, Mint Museum of Art, Gibbes Museum of Art, and the New Britain Museum of Art. Biggs lives and works in New York. For any inquiries please contact Candace Moeller at 212.594.0550 or candace@cristintierney.com.